Fight to Reduce LOD Death & Injury! Over the last decade, 1,068 officers have been killed in the line of duty. 377 killed by handguns, 577 died in accidents, almost always involving a vehicle. 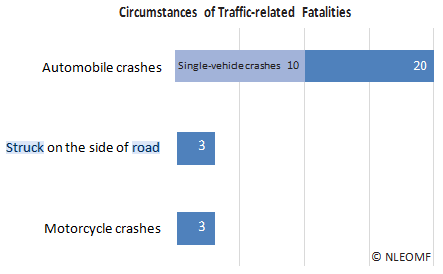 * Traffic-related fatalities were the leading cause of law enforcement deaths during the first half of 2017. Every six weeks a LEO is killed or injured as a result of a pursuit related event. The average police officer receives regular firearms training and practice – but only receives 40 hours of total driving training, according to a 2006 Justice Department report.